Update – venue change: The show has been moved across the street to 70 Peter St. See you there! 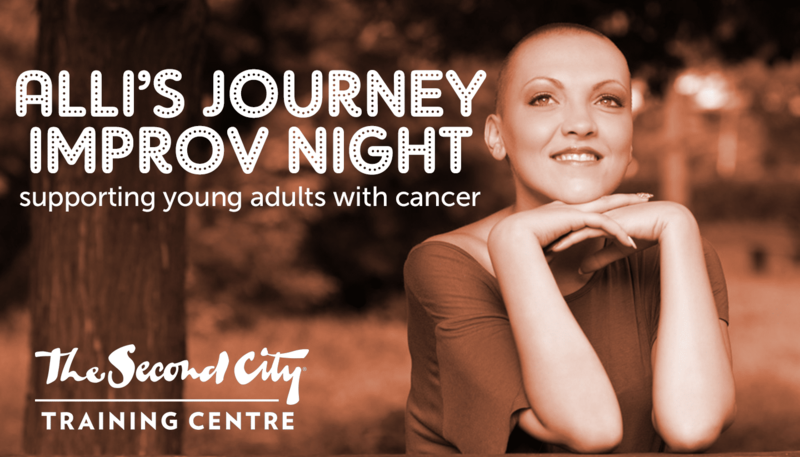 Alli’s Journey is hosting our second annual Improv Night fundraiser at Second City on August 21st, 7pm, and we would love to see you there. Improv comedy is comedy that’s improvised before your very eyes, based on audience suggestions and answers given to our performers. Last year’s had people absolutely in stitches and we bet this year’s will be the same. Love to laugh? Come on out! The Improv Night fundraiser goes to support our Comfort Bags initiative. These are bags of products and resources given to young people (18-35) undergoing cancer treatment. The items are selected based on feedback and iteration with an eye to providing comfort and pleasure during the difficult period of cancer treatment. Your collective support at this event will allow us to produce dozens and dozens more comfort bags. Finally, please note that this event is at the Second City Training Centre’s John Candy Box Theatre – not the main stage on Mercer St., but just around the corner from it, above Wayne Gretzky’s: 99 Blue Jays Way, Toronto, ON M5V 9G9.